When I worked outside of the home I enjoyed packing a lunch everyday for myself. I don’t function well unless I’ve had something healthy to feed my brain. I’m sure you’ve all seen salad jars, but have you actually ever made one? I wish I had known about them when I was packing my lunches all those years! I hadn’t seen this brilliant idea until last year. I work from home now, but I still love them. They are easy to put together. 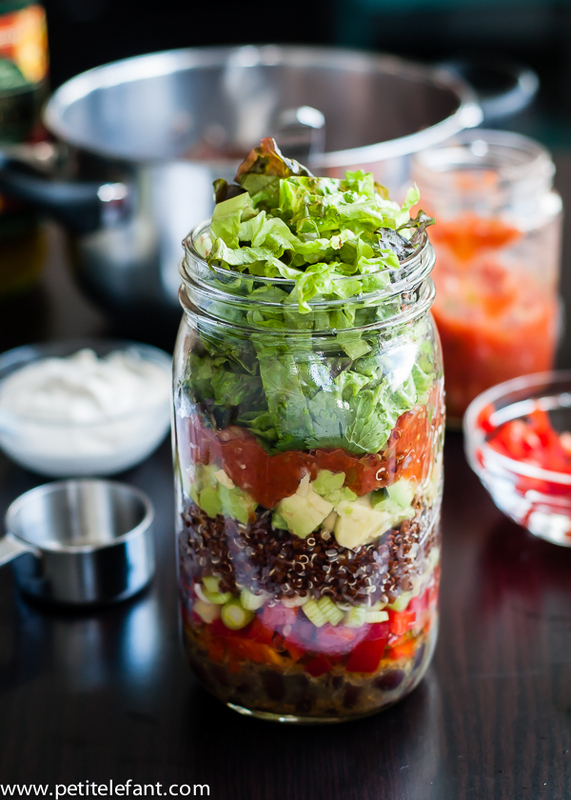 Depending on what you layer in the jar, you can even make them once a week for the whole week. 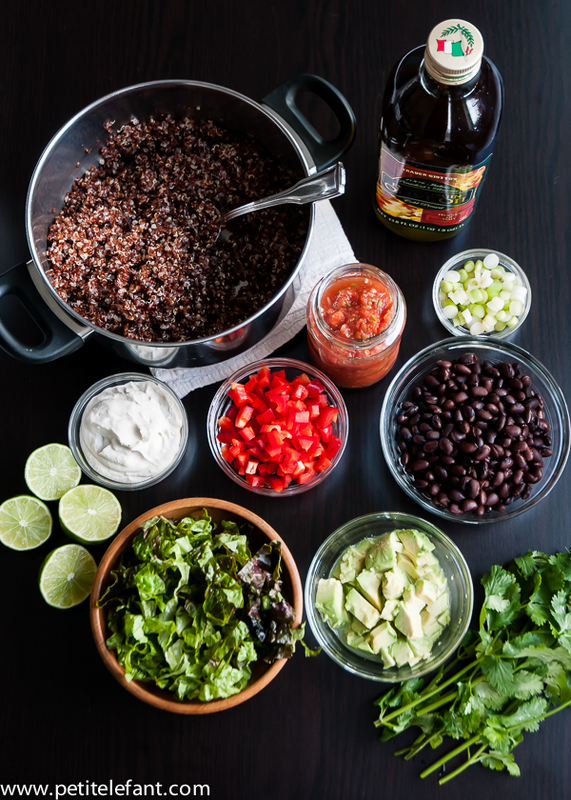 For this one, I’m using my very favorite quinoa taco salad recipe – minus the taco. 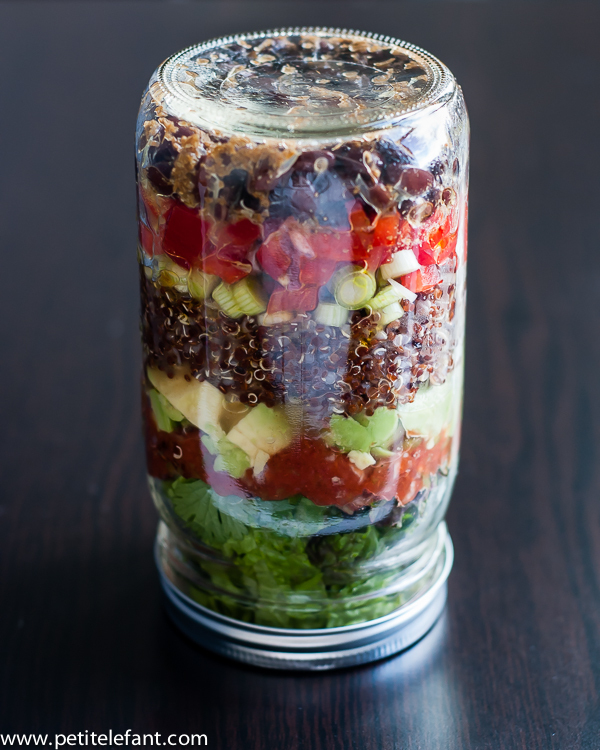 The idea with these taco salad jars is to layer the vinaigrette at the bottom and work your way up to the leafy greens. That way the greens stay fresh because they haven’t been sitting in the dressing. When it’s time to eat, you just turn the jar over. The dressing coats everything and it’s ready to eat! Then you just start layering. You can just eat it out of the jar. If I’m at home, I transfer it to a plate. It’s a little easier to eat that way. 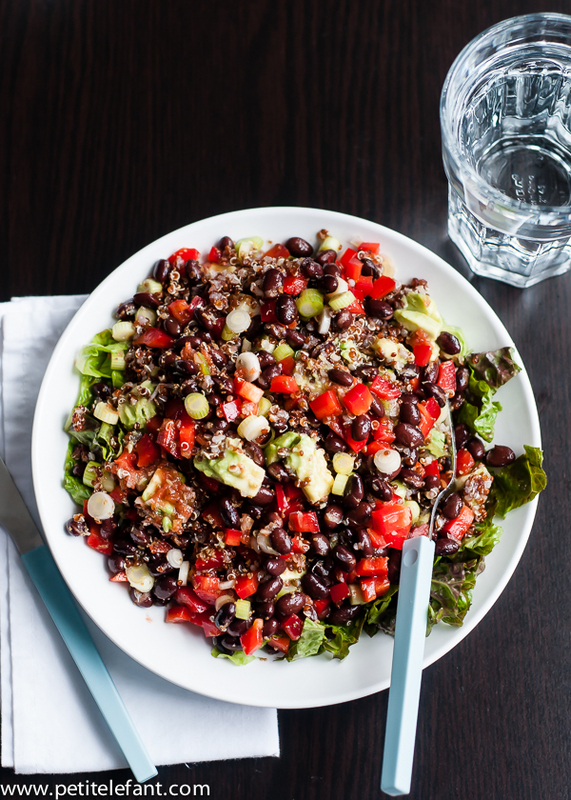 But you can also see that it fills up a salad plate and makes for a yummy, filling lunch. Note: This makes a big, hearty salad. This can also be separated out into two pint-sized jars for two smaller salads. 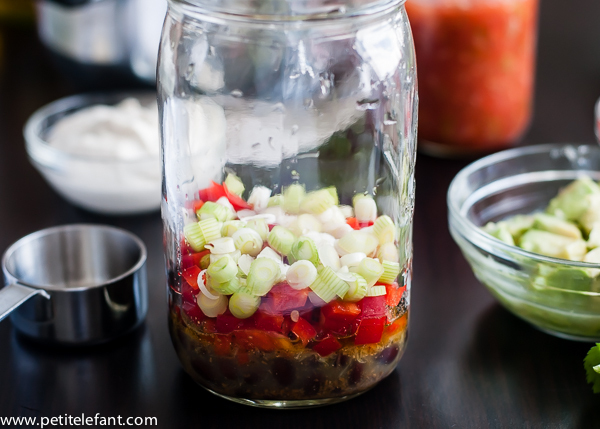 For vinaigrette – whisk all of the ingredients together and pour in the bottom of a quart-sized canning jar. 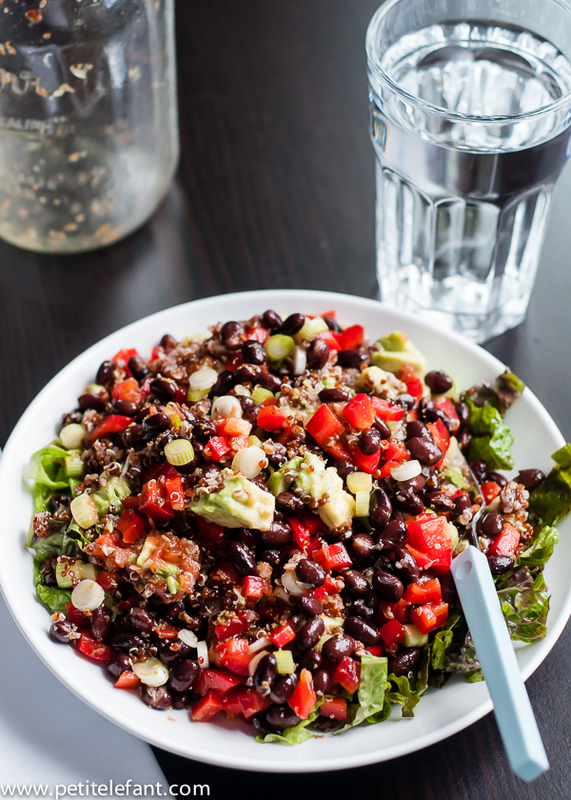 For salad – Layer ingredients in jar in the order listed (black beans, diced pepper, green onions, quinoa, etc.) ending with the lettuce. Top with lid and refrigerate until ready to eat. Can be made 2-3 days in advance. 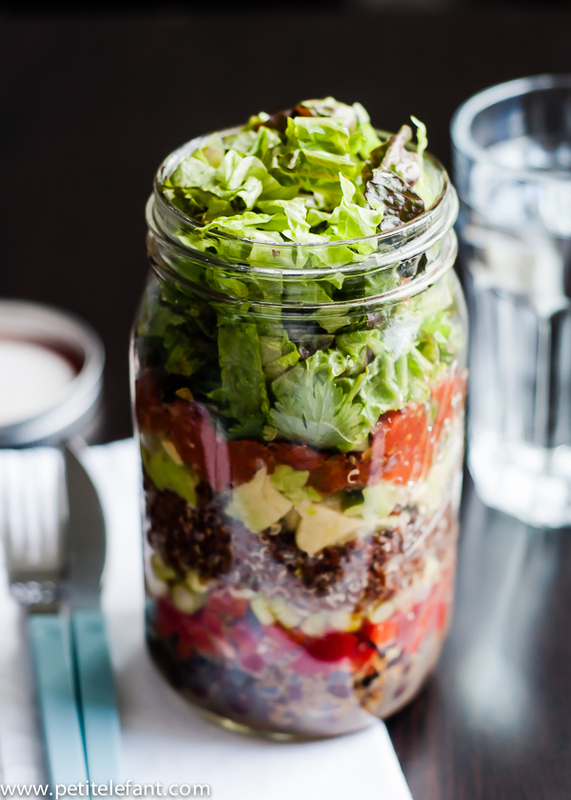 To eat – turn jar over to let vinaigrette coat the salad ingredients. Eat out of the jar or turn out onto a plate. Using the glass jar is visually appealing and made me think of many variations. I am glad you pointed out that it can easily be eaten at home as well. Do you suggest a particular kind of jar, or size?